It has been another successful year for the Southside Virginia Regional Technology Consortium (SVRTC) in the FIRST Robotics Program! This year, a number of high schools sponsored FIRST Robotics Program teams. In January, these teams received information about the “game” including rules, building information, and everything needed to design and build a robot suitable for competition. Using these tools, the teams of students brainstormed and considered strategies for acquiring the maximum number of points during a match. The teams had 6 weeks to make their design become a functional robot. During the 6-week build, students designed and assembled a robot using a chassis of extruded aluminum, transmissions, specific wheels or tracks, wheel motors, speed control devices, pneumatic cylinders and solenoids, compressors and regulators, solid state switching systems, limit switching, encoded movement, sonar distance sensors, photocell position sensors, temp sensors, belt and/or chain drive systems, WiFi, USB, and bluetooth communications, CAN systems, Labview Programming, and more. SVRTC became involved in promoting FIRST in high schools within its consortium. Sponsored by the Mid-Atlantic Broadband Cooperative (MBC), the SVRTC aided in identifying high schools with an interest in starting a new robotics team. MBC provided startup grants to help schools get started. Teachers from various disciplines assisted the teams during the build. Students not only had to recall their math skills, like algebra and trigonometry, but also learn new skills as they participated throughout the 6-weeks. Mentors also guided students to learn from their experiences. In some cases a student will begin in FIRST not knowing how to use a screwdriver or socket. Hands on guidance is an integral part of the build.SVRTC‘s and ITTIP’s Senior Technology Engineer, Bill Wilson, has been a key player in mentoring these teams by providing consulting, programming sessions, while also traveling to divisions and competitions all over the region to support the robotics teams. This year SVRTC had teams within the counties of Amelia, Cumberland, Danville, Halifax, Martinsville, Mecklenburg, Lunenburg, Pittsylvania, and Sussex. 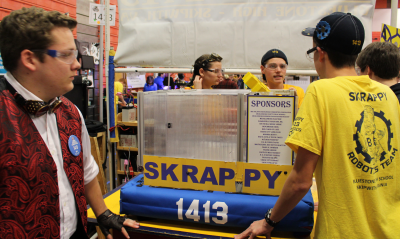 Over the course of the FIRST Robotics Program season, two teams earned a spot to compete in the World Tournament being held in St. Louis, Missouri. These teams are Team 1262 – The Stags, out of Martinsville, Virginia, and Team 1598 -Team Talon, out of Danville, Virginia. We will be following these teams to cheer them on. We hope you do too!